Born on 1 July 1805 in Upper Milford Township, Northampton County, Pennsylvania, Reuben Wetzel was a son of John Jacob Wetzel and Susanna (Jacoby) Wetzel. He spent his formative years there during an era when Pennsylvania’s Lehigh Valley was in transition, expanding both in terms of population and the ways in which its inhabitants made their living. On 6 March 1912, their township was one of several taken from Northampton County to make up the newly formed Lehigh County. On 17 November 1831, Reuben Wetzel married, taking Sarah Schäfer as his bride. Their wedding ceremony was held at the Emaus Moravian Church in Emaus (now Emmaus) in Lehigh County. Although they could not know it at the time, the month and day chosen by Reuben and Sarah for this joyous occasion would have lasting implications for their union. In 1840, Reuben and Sarah Wetzel’s household of seven in Upper Milford Township, Lehigh County included son James (1837-1890), who would later go on to serve during the Civil War with Company D of the 128th Pennsylvania Volunteer Infantry, and daughter Emalina (1840-1923), who would later wed Lewis Reinbold (1838-1914). A decade later, their Upper Milford Township home also included daughters Polly/Maria (born sometime around 1845) and Emmalinda (1847-1870), and their three-month-old son, Samuel. Reuben supported his growing family on the wages of a carpenter. His son Samuel evidently died in childhood because, while he was shown on the 1850 federal census, he was not listed with the family on the federal census of 1860. By 1860, the Wetzel family had relocated to Coopersburg in Lower Milford Township. Residing with Reuben and Sarah Wetzel at this time were daughters Emalina, Polly/Maria and Emmalinda, and Emalina’s four-month old son, Charles H. Reinbold (1860-1934). Others residing at the Wetzel home at this time included: Elauisa Glick (age 1), Mary Engelman (age 64), and Sarah Lanwitz (age 5). Reuben Wetzel enrolled for Civil War military service on 11 September 1861 in the Borough of Allentown in Lehigh County, Pennsylvania, and officially mustered in for duty on 18 September at Camp Curtin in Harrisburg, Dauphin County as a Private with Company G of the 47th Regiment, Pennsylvania Volunteer Infantry. He served under Captain Charles Mickley and 1st Lieutenant John J. Goebel. Military records at the time described Private Wetzel as a 46-year-old carpenter and resident of Lehigh County who was 5’5″ tall with gray hair, brown eyes and a dark complexion. Sometime after muster in, he was assigned to duties as Company G’s Cook. Col. Good, who has command of our regiment, is an excellent men and a splendid soldier. He is a man of very few words, and is continually attending to his duties and the wants of the Regiment. As a unit of the 47th Pennsylvania Volunteers, Company G became part of the federal service when the regiment officially mustered into the U.S. Army on 24 September. 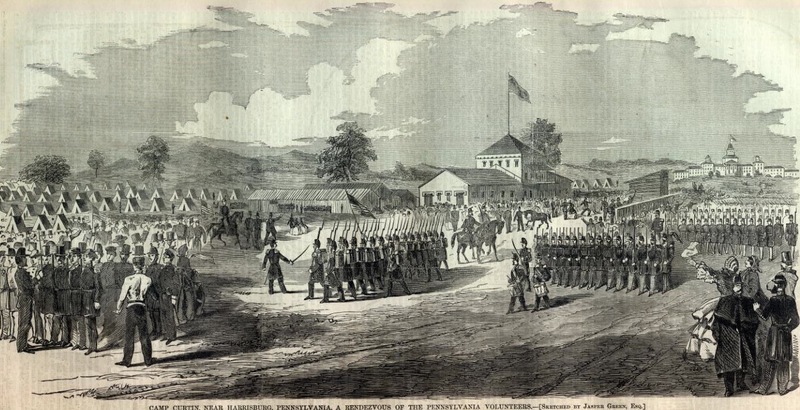 On 27 September – a rainy day, the 47th Pennsylvania was assigned to Brigadier-General Isaac Stevens’ 3rd Brigade, which also included the 33rd, 49th and 79th New York regiments. By that afternoon, the 47th Pennsylvania was on the move again. Ordered onward by Brigadier-General Silas Casey, the Mississippi rifle-armed 47th Pennsylvania infantrymen marched behind their regimental band until reaching Camp Lyon, Maryland on the Potomac River’s eastern shore. At 5 p.m., they joined the 46th Pennsylvania in moving double-quick (165 steps per minute using 33-inch steps) across the “Chain Bridge” marked on federal maps, and continued on for roughly another mile before being ordered to make camp. I John J. Goebel formerly First Lieutenant of Co. “G”, commanded by Capt. C. Mickley, who was killed at Pocotaligo, now commanded by me, do certify on honor that Reuben Wetzel was a private of said Co. “G” 47th Reg. P.V. that he was mustered into the United States Service for three years or during the War, at Harrisburg Penna on the eleventh day of September A.D. 1861, and continued in actual service up to the time of his death. That sometime in October 1861, he broke one of his legs, which was afterwards amputated in consequence of which he died at General Hospital, Union Hotel, Georgetown, D.C., on the seventeenth day of November A.D. 1861, whilst in the service of the United States in the line of duty. Comdg. G. Co. 47th P.V. Based on his review of military records, historian Lewis Schmidt believed that Pvt. Jacob H. Bowman (aged 35), a former Allentown miller and Company G’s designated wagon master, was likely the driver at the time of Private Wetzel’s accident. 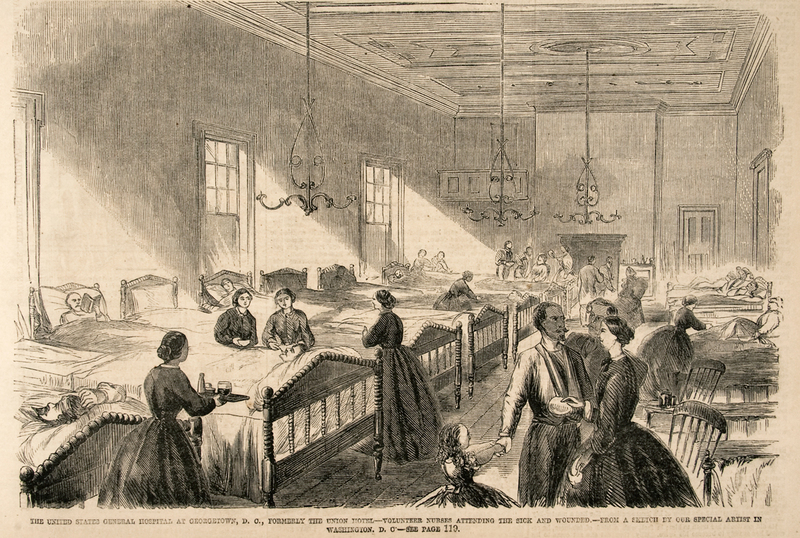 Volunteer Nurses Caring for the Sick and Wounded, Union Hotel, Georgetown, 6 July 1861 (Frank Leslie’s Illustrated Newspaper, No. 294, Vol. 12, public domain). Although alive when pulled from the wreckage, it was immediately obvious that Private Reuben Wetzel’s military career would be short-lived. He had fractured a tibia, a serious injury even today because this shin bone is the largest and strongest of the two leg bones below the knee. Treated initially in the field and then at Camp Griffin, Virginia by regimental physicians, he was transported three days later to the Union Hotel in Georgetown, Washington, D.C., where the Union operated one of its larger general hospitals. Head Quarters “G” Co. 47th Regt. P.V. I certify on honor that Reuben Wetzel, late a Private of “G” Co. Regt. P.V. while in the line of his duty, and whilst the Regiment was moving from Ft. Ethan Allan to Camp Griffin, Va. on or about the tenth day of October 1861 has fractured his leg, the facts and circumstances attending the breaking of his leg are as follows: The said Reuben Wetzel Private was at the time detailed as Company Cook, the Cooking Utensils being all loaded on the wagons, and the Company Cooks ordered to remain in charge of them, to stay with the Train, as it became night and dark, and the roads being bad to march, he got on horse back, on the hind off [sic] horse of his wagon, the wagon where his Cooking apperattus [sic] had been loaded on, and as they crossed a deep ditch the wagon tongue knocked him off from the horse, the front wagon wheel passing over his leg and thus causing the fracturing of the same without any cause or fault of his own, on the 3rd day following he was removed from Camp Griffin Va. to the Union Hospital at Georgetown D.C. Later his leg was amputated; inflamation [sic] ensued causing his death on the 17th day of November, following. I further certify that this catastrophy [sic] occured [sic] to Reuben Wetzel Private of “G” Co. 47th Regt. Pa. Vols. while in the service of the United States and acting in the line of his duty and in obedience to orders of his Commanding Officer. Capt. Comdg. G. Co. 47th P.V. Ether or chloroform was applied to a cloth cone that was placed over the mouth and nose of the patient. The patient became stuporous in a matter of minutes. This state lasted for more than enough time to perform an amputation, which took about 6 minutes to complete. Union surgeons used anesthesia in more than 80,000 operations. The skin and muscle were then cut with amputation knives several inches above the fracture site. The muscles were pulled up to expose the bone. An amputation saw was used to cut through the bone. Once the cut was completed, large arteries were pulled out from the stump tissue with a tenaculum and tied off to prevent bleeding. The skin muscle was then released and the tissue sutured. Two types of amputation were commonly used. A circular amputation involved cutting straight through the skin to the bone and resulted in a stump that was circular in appearance. A flap amputation required the tissue to be cut leaving two flaps of skin that were used to create a stump. Following the amputation of his leg, Private Wetzel fought valiantly but in vain. The shocks to his system from the initial accident and the trauma of amputation, combined with the resulting inflammation following the removal of his leg, were just too much to overcome. He succumbed at the Union Hotel General Hospital in Georgetown, Washington, D.C. on 17 November 1861, just five weeks after the senseless accident – and exactly 30 years to the day on which he had wed Sarah Schäfer in Emaus, Pennsylvania. Private Reuben Wetzel, Co. G, 47th Pennsylvania Volunteers, Tibia Fracture and Death, 17 November 1861 (Registers of Deaths of U.S. Volunteers, public domain; click twice to enlarge). 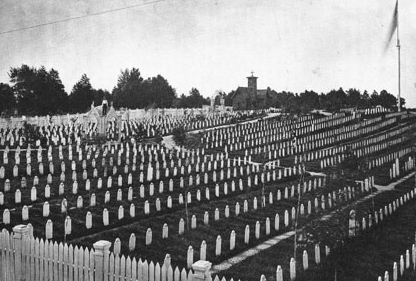 U.S. Soldiers’ and Airmen’s Home National Cemetery, Washington, D.C. (public domain). Following his death in Georgetown, Private Reuben Wetzel was promptly interred on the grounds of Military Asylum Cemetery. Now known as the U.S. Soldiers’ and Airmen’s Home National Cemetery, a cottage on the grounds of the cemetery was used by President Abraham Lincoln and his family as a place of respite from war-weary Washington, D.C. during the Civil War. Private Wetzel’s widow was ultimately awarded a Civil Widow’s and Orphans’ Pension of $8.00 per month, which enabled her to raise their daughter Emmalinda, who was just 14 when her father lost his life that terrible day in November 1861. Emmalinda grew up and married, but sadly, her life was also a short one. She passed away in 1870, and was interred at Allentown’s Fairview Cemetery, the same cemetery where her mother, Sarah, was laid to rest. Two of the Wetzel’s other childen, James and Emalina, also married. Both had children and lived long full lives. James E. Wetzel, who also fought in the Civil War, passed away in 1890, and was interred at the Rittervsville Cemetery in Allentown. Emalina witnessed the dawn and progress of a new century before passing away in 1923. She now rests at Saint Mark’s Cemetery in Allentown. 1. Bates, Samuel P. History of the Pennsylvania Volunteers, 1861-5. Harrisburg: 1869. 2. Schmidt, Lewis. A Civil War History of the 47th Regiment of Pennsylvania Veteran Volunteers. Allentown: Self-published, 1986. 3. The Smell of Ether, the Odor of Blood, in Trauma and Surgery, in To Bind Up the Nation’s Wounds. Silver Spring: National Museum of Health and Medicine, retrieved online 27 March 2016. 4. Wetzel, Reuben, in Burial Records, President Lincoln’s Cottage at the Soldiers’ Home. Washington, D.C.: President’ Lincoln’s Cottage, 2009. 5. Wetzel, Reuben and Sarah Schäfer, in Emmaus Moravian Church Records, in Historic Pennsylvania Church and Town Records. Philadelphia: Historical Society of Pennsylvania, 1831. 6. Wetzel, Reuben, in Interment Control Forms (A1 2110-B), U.S. Office of the Quartermaster General (Record Group 92). College Park: U.S. National Archives. 7. Wetzel, Reuben, in Registers of Deaths of Volunteers, U.S. Adjutant General’s Office (Record Group 94; ARC ID: 656639). Washington, D.C.: U.S. National Archives and Records Administration, 1861. 8. Wetzel, Reuben and Sarah Wetzel, in U.S. Civil War Pension Index and U.S. Civil War Widows’ and Orphans’ Pension Files (application no. : 15547, certificate No. : 24893, filed by the veteran’s widow, Sarah Wetzel, 17 March 1863). Washington, D.C.: U.S. National Archives and Records Administration, 1863. 9. U.S. Census. Washington, D.C. and Pennsylvania: 1810, 1840, 1850, 1860, 1870.